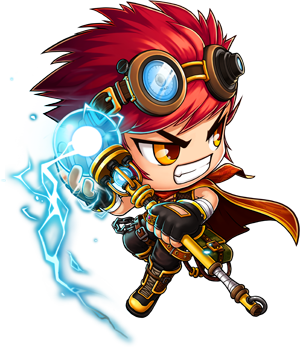 Big Bang is the first major update in MapleStory, which came about when the Black Wings had resurrected their dark leader, the Black Mage, who had caused destruction to the world and its citizens many years ago before he got sealed away by the Heroes. When the Black Mage had returned to reality, he cast a spell on Maple World, causing Victoria Island to rearrange completely, and all of Maple World's monsters to change level, power and looks. Now, more than ever, the Explorers of MapleStory are needed once more to band together with the Cygnus Knights, the Heroes, and the Resistance to defeat the Black Mage and once again return peace to Maple World! 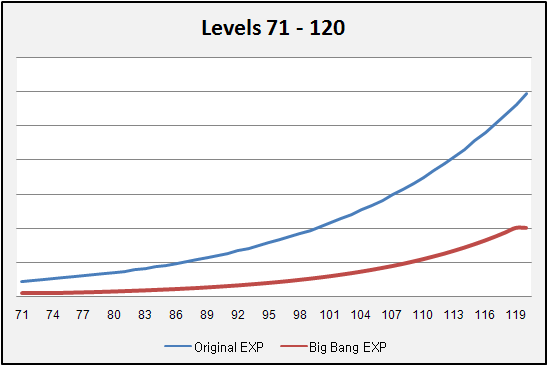 As mentioned in a previous post, the experience curve for leveling is much less steep after Big Bang than it was previously. 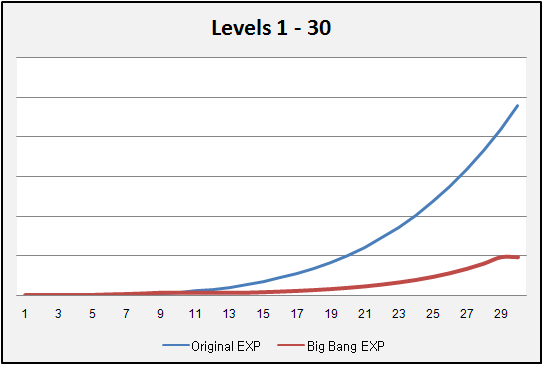 This means from Lv.10 on, the amount of experience points needed to progress from one level to the next is lower, making leveling up faster throughout levels 10 - 200. 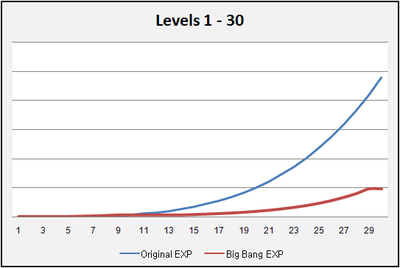 One of the biggest features in Big Bang is a revamped level experience curve. 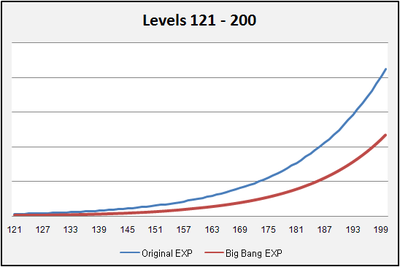 In the biggest update ever for MapleStory, leveling is an enjoyable challenge, not a difficult climb. Our focus was to help as many players as possible experience the varied and fantastic content we’ve developed over the last 5 years. 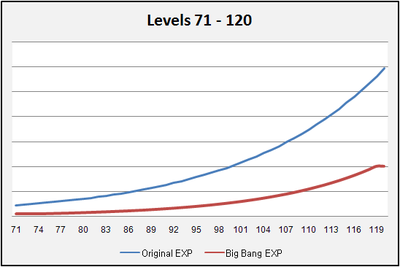 We’re presenting visual graphs of the level by level gains needed to go from level 1 to 200 in Big Bang. Enjoy! 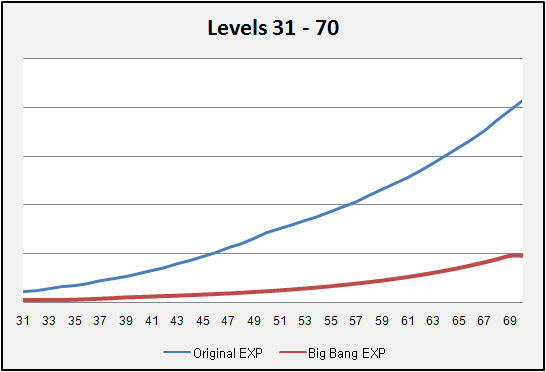 The new level curve puts an emphasis on rewarding you for hard work and helping you experience the best adventures in the game. Extensive changes have been made to the fighting system. The formulas for damage, defense, accuracy, and avoidability have all been extensively overhauled. Important to note for new and old players alike is that accuracy is decreased by a set amount for every level lower than a monster you are, to prevent players from attempting to hunt monsters that would be too difficult for them. Several changes have been made to maps throughout Maple World, with the most extensive change being a completely rearranged Victoria Island. Towns have new layouts, and many monster maps have been removed or replaced. Foot travel to the Victoria Island towns has been expedited with the addition of Six Path Crossway to the center of the island as a hub. The entrance to Sleepywood and the airships to Orbis and Ereve have been moved to Six Path Crossway as well. Some modifications have been made to Orbis to make the town easier to navigate. The drop rates of many Use and some Etc. items have been increased, with the drop rate of most HP and MP recovery items having been increased considerably. The starting levels for some party quests have been changed, and the upper level restriction for most party quests has been removed. Many party quests that weren’t previously in the Party Search menu have been added to it. Modifications have been made to some of the party quests, such as First Time Together. Astaroth has been added as an option to the Dimensional Mirror for characters of the appropriate levels. Most NPCs in Maple World received a lesson in grammar, so their dialog should be grammatically correct. Most quests in the game have been retooled. Quest requirements have been adjusted in response to the changes in maps and in monster levels. 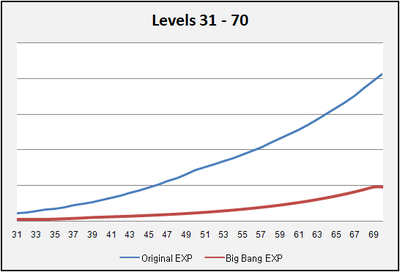 Quests that are now for a different level than before have had their rewards adjusted accordingly. The hunting and/or collecting requirements for the completion of many quests have been lowered to expedite their completion. The experience rewarded for many quests that are still for the same level has been increased. Most monsters throughout Maple World have had adjustments made to their levels, to varying degrees. 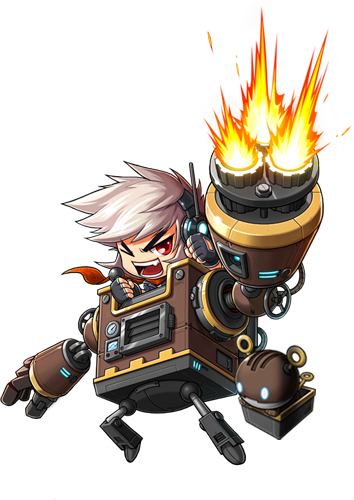 The stats of monsters—as well as the experience they give, the amount of mesos they drop, and the level of the equipment they drop—have been adjusted accordingly. 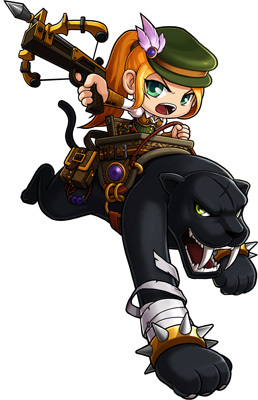 The levels of monsters have been specifically adjusted and consolidated to one area in order to prevent an excessive need for travel throughout Maple World for quests of certain level. Some monster maps are now restricted by level to help prevent players from wandering into areas that are beyond their level range. Skills for all jobs have been streamlined and consolidated into the most useful ones. If you had Skill Points assigned to a skill that has been removed, those points will be returned to your SP pool. A warning message will appear when you assign all SP normally obtainable to a lower job, to prevent you from accidentally assigning too many SP to an earlier job. The Resistance (Battle Mage and Wild Hunter) are the rebellion against the Black Wings and they will free from Edelstein, no matter the cost. Using new magic and their natural skills, new heroes will join the legends of Maple World to battle the minions of the Black Mage. Hiding as ordinary Edelstein citizens by day, by night a growing legion will band together to overthrow the Black Wings. New Classes: Battle Mage and Wild Hunter. The highly anticipated Mechanic Class is available! Now you can have your very own mech to smash foes with. Once you have completed all of the required tutorial quests, and reached level 10. Follow the instructions from Headmaster Ferdi to become a Mechanic. Resistance characters created before the patch who have completed all of the required tutorial quests, reached level 10, and haven’t made the first job advancement will also have the option to become a Mechanic. Mechanics do not share their Cash Inventory with other characters.